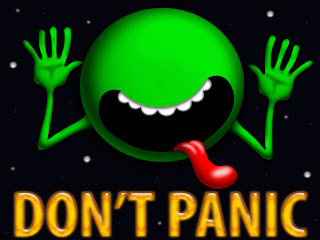 The Zeonic Geofront: Don't Panic! Someone wrote a sixth Hitchhikers Guide? Don't Panic! Someone wrote a sixth Hitchhikers Guide? Well I must have been living under a rock for the last year, as I had no idea Eoin Colfer had been commissioned to continue on with the Hitchhiker Guide to the Galaxy series and that the book gets released this week. 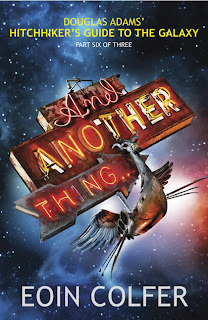 The book is called "And Another Thing...", a reference to the third book in the series, and not the first book, like all the others have been. I honestly have no idea how I feel about this. I'm not familiar with Eoin Colfer at all. I've just downloaded the first Artemis Fowl book that he wrote just to get a sense of how he writes before I plunge into the new H2G2 book. Supposedly they are very good books, and I never read them before because I thought they were just Harry Potter clones. So I can't be excited or scared about the new author. As for the, "Is nothing sacred?" point of view, I'll say I never liked that the series ended on a sad note, considering it was such a light hearted series. I also felt like Mostly Harmless was setting things up for the future (Arthur and Trillian's daughter), that was never fully realized. And there are countless documented interviews where Douglas Adams said he wanted to do another Hitchhikers and end it more positively. So this book was in the cards, had he not met an untimely end. And this isn't the first attempt to rectify the bleak ending of Mostly Harmless, as the radio dramas gave the story a happy ending, and no one argued the canonicality (yes I made up that word just now) of those instances. Ultimately I'm still torn, but I will give it a read and I will go in with an open mind. Douglas Adams seemed like such an easy going and nice guy I am pretty certain he would be fine with the continuing of the series. It will just be hard for me to consider it as anything other then fan fiction. Gundam Unicorn to get World Wide DVD release. What should Castle go as for Halloween? John Titor? Marty McFly? The Borg? Kyle Reese? SD Gundam + Romance of the Three Kingdoms? All Hail the Queen! HARUHI the MOVIE!